Banyan Tree Theatre Group is an all-female BAME emerging theatre company from Brighton established in 2010. 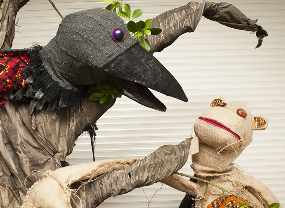 Originally known as MOSAIC Puppet Theatre Group, we became an independent organisation in 2014. We arose out of a shared ambition to create an arts organisation with a unique and independent identity that would bring BAME stories to wider young audiences. We collectively write our own scripts and music and make our own puppets, which all draw from the artistic repertoires of our diverse cultural heritage (British, American, Zambian, Sri Lankan, Nigerian, Indian, Jamaican, Cuban, St Kittian). Social inclusion is at the heart of what we do and has helped us to develop a local audience base. Our children’s musical theatre work with marginalized communities in Brighton includes MOSAIC Black and Mixed Heritage Family Group, Brighton & Hove Black History Month events and free workshops in the wider community, . Since forming in 2010, we have held performances and workshops across Brighton and Hove. We performed our own adaptations of two African folk tales, The Fire Children (2010-2011) and The Honey Hunters (2012), at venues across Brighton and Hove to near sold-out audiences; and our most recent production, Why Mosquitoes Buzz (WMB) in 2014 also to near sold out audiences in community settings (Jubilee Library, Hove Town Hall etc.) and the group were successful in securing Arts Council Funding for a period of professional development leading to sold out shows at the award winning venue, The Warren in Brighton Fringe 2015. WMB is our adaptation of a West African folktale featuring puppets made using African wax fabrics, original live music reflecting BAME musical influences such as soca, calypso and lovers' rock, and African dance-inspired movement (Azonto). It is a story about taking responsibility for one's actions and the power of forgiveness. The success of WMB has led to us adapting the show and developing a schools performance and workshop package. We were able to deliver our first school booking to 100+ nursery and reception children at Fairlight Primary in June 2015. This proved to be a great success and we are now in talks with EMAS (Ethnic Minority Achievement Service) in Brighton with a view to taking the show to more schools across the city. Since 2012 we have delivered story-based anti-discrimination workshops in primary schools throughout Brighton and Hove through the Cric! Crac! programme, created by Banyan Tree member Alison Martin. Members of Banyan Tree have also been involved in Zum Zum Singers, a legacy music project funded by Rhythmix, a Brighton music education charity, through which we recorded a CD of children’s songs from our many homelands which has since been used in local primary school music classes. We are currently developing relationships with new venue BOAT (Brighton Open Air Theatre) with a view to participating in a two week children’s theatre festival planned for June / July 2016 and in more regular children’s theatre programming at Komedia.